In the recent case of Adetoye v The Solicitors Regulation Authority  EWHC 707 (Admin), the High Court considered whether a losing party should be allowed to file its appellant’s notice after the filing period had elapsed. For context, the relevant facts of proceedings were as follows. The Solicitors Disciplinary Tribunal (SDT) served its written judgment on disciplinary proceedings, involving the appellant, on 11 December 2018. Pursuant to CPR 52.12(2)(b), an appellant has 21 days after the date of the decision (the tribunal decision), to file an appellant’s notice. Effectively, the last opportunity for the notice to be filed in time was by the close of 1 January 2019. However, this step was not completed until 10 January 2019, i.e. 9 days after the filing period had expired. As a result of non-compliance, the appellant sought an extension of time to file the notice. However, the respondent contested the appellant’s application, submitting that they should not be granted permission to file their notice out of time. ‘In Mitchell itself the court made it clear ... that it considered that ... an application for an extension of time for service of particulars of claim as being in substance an application for relief from sanctions under CPR 3.9, and since then the concept of the implied sanction has played a prominent part in a number of decisions ... The court held [in Baho v Meerza  EWCA Civ 669] that the Mitchell principles applied to such an application and declined to grant relief, even though the application was no more than 7 days out of time. Accordingly, I think it is now established that an application for permission to appeal out of time is analogous to an application under rule 3.9 and is therefore to be decided in accordance with the same principles. 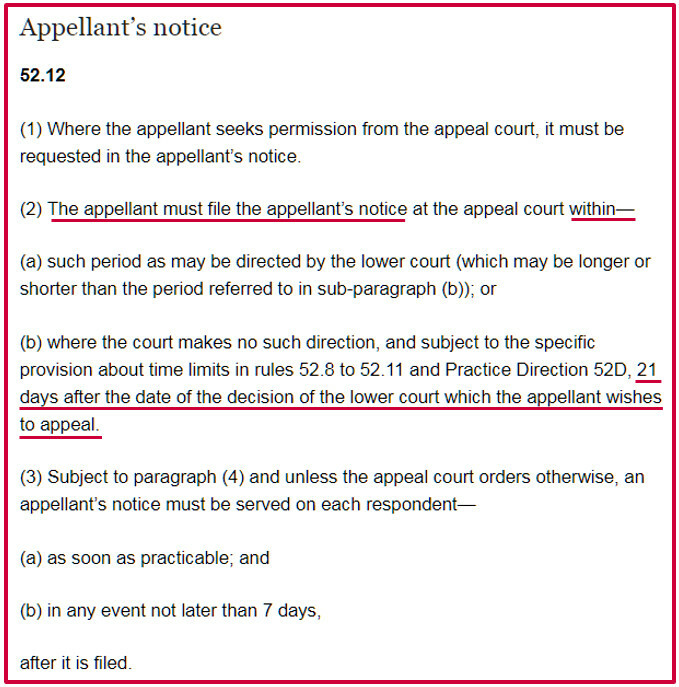 The reason ... for treating an application for permission to appeal out of time as analogous to an application for relief from sanctions ... [is] ... that without such an extension the appeal ... [can] ... not proceed ... The purpose of the respondent's notice is to enable ... [an appellant] ... to rely at the hearing of the appeal on grounds for upholding the judgment that were not before the court below. If an extension of time is not granted it will be unable to do so. To that extent that area of dispute will not come before the court ... In my view, therefore, the Mitchell principles apply with equal force to an application for an extension of time in which to file a respondent's notice’. As such, it was necessary for Mr Justice Moyston, at the application hearing, to conduct the 3-stage test for granting relief from sanctions, which was established in Denton & Ors v TH White Ltd & Ors  EWCA Civ 906. ‘I do not regard the nine-day delay which accrued over the holiday period as being particularly serious. The reason for the delay was the banal failure of the appellant to check his spam folder. I do not particularly criticise him for that. No injustice is caused to the respondent if I proceed to hear the merits of the appeal. Indeed, Mr Ramsden QC has fully addressed both in writing and orally. Accordingly, I grant the necessary extension of time’. ‘If the breach is neither serious nor significant, the court is unlikely to need to spend much time on the second and third stages’. Thus, by interpretation, irrespective of the appellant’s legitimate excuse, it was ultimately immaterial to the appellant’s success because the 1st stage of Denton is the most pivotal to obtain relief from express or implied sanctions.